My guest today is fellow Aussie, Alison Stuart, who is an award winning writer of historicals with heart. Whether duelling with dashing cavaliers or waywards ghosts, her books provide a reader with a meaty plot and characters who have to strive against adversity, always with the promise of happiness together. Alison is a lapsed lawyer who has worked in the military and fire service, which may explain a predisposition to soldier heroes. She lives with her own personal hero and two needy cats and likes nothing more than a stiff gin and tonic and a walk along the sea front of her home town. She loves to hear from her readers and can be found at her website, facebook, twitter and Goodreads. Her latest book, Gather the Bones, is a “Downton Abbeyesque” haunting love story set in 1923. Elisabeth, I can’t think of a time in my life when I wasn’t writing. Somewhere in the attic there are still notebooks filled with stories, probably all bearing a vague resemblance to whatever book I had just read. My best friend at school was also a budding writer and we made a pact to write our first novels. We would spend our lunchtimes perched in the willow tree working away…mine was (of course) and English Civil War story and hers science fiction. She became a published author years before me!What is the inspiration for your current book? I will talk about my September 2012 release, Gather The Bones, which was by far the most complex book I have written, not only does it cross genres (mystery, history, romance and ghosts) but also tackles the theme of war (which I will discuss below). A number of different influences came together to bring this book to fruition, but the first is probably a professional interest in military history (I am a former Army officer). Visiting the battlefields of World War One and spending time at the graveside of a young relative moved me profoundly. I put an asterix and move on… or I hit “thesaurus” in the word processing package. <Looks around office and just sees a muddle>. Hmm…2 things:I have a small leaden statue of a Roundhead soldier that has sat on the shelf above my computer for twenty years. I thought I had lost him and I was heartbroken but he turned up and I couldn’t imagine writing without him looking over me. 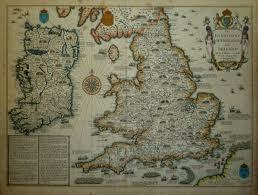 The second object is an original seventeenth century John Speed map of “Invasions of England and Irelande” which my father gave me. It has travelled everywhere with me. Just write the book…but don’t expect that first draft to be of the quality that is submissible to an editor. The important thing is to get the story down so that it is vaguely “story shaped” with a beginning, a middle and (most importantly!) and END. I have seen so many aspiring authors spend all their energy on polishing and polishing that front part of the book that it is never finished. Once you have that rough draft, that is when you start the rewrite and the polish. I am turning to crime…historical crime. I actually read more mysteries then I do romances so it seems a natural progression. I don’t want to jinx myself by saying too much beyond – “cosy” mystery, Singapore…1910. Thanks for joining me, Alison. 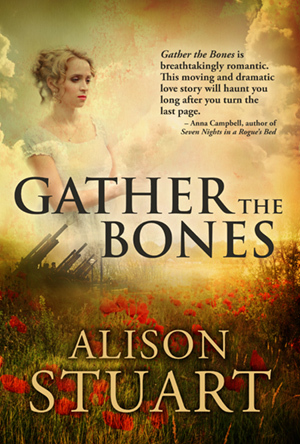 And congrats on Gather the Bones, being a finalist in the 2012 Australian Romance Readers Awards, 2012 CRW Award of Excellence, 2013 GDRWA Booksellers Best Awards and the 2012 RONE Awards. Well done! You can connect with Alison via Facebook, Twitter and Goodreads.She would love to hear from you.All Alison’s books are available for purchase via her website.